Results: Using computational resources from INCITE and Pacific Northwest National Laboratory's NWICE, researchers are shedding light on complex chemical reactions at interfaces. 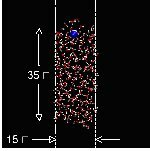 The PNNL computational approach sought to resolve a mystery that had eluded experimentalists - where are hydroxide ions located on molecules as they move from the liquid to the gaseous state? This new understanding has far reaching implications for chemistry that can occur at hydrophobic interfaces important to chemical transformations. Why it matters: The new insights have applications in the development of novel materials. In addition, this new information may help scientists and engineers design better chemical processes and catalysts, which increase the speed and efficiency of important chemical reactions. Methods: The models the research team uses accurately portray reactions under real-world conditions using a combination of statistical and quantum mechanical methods. This integration of methodologies requires the processing power and speed of supercomputers. Using umbrella sampling as its statistical mechanical sampling method in conjunction with density functional theory interaction potentials, the researchers performed some of the largest calculations to date. Density functional theory provided the compromise between speed and accuracy to help clarify chemical phenomena in heterogeneous environments. Free-energy surfaces and representative clusters as a function of the sampled reaction coordinate ("δ" being a measure of the distance from the proton transfer transition state). One can see a distinct difference in the free-energy as compared to the bulk (blue). The red and green curves represent free-energy profile at the onset of (the so-called Gibbs dividing surface (GDS)) and slightly above the interface. The blue curve was calculated using NWICE and red and green curves using INCITE and NERSC resources. To the right of the graph are representative clusters of OH- in the interfacial region as a function of "δ." The salient feature is the clear delocalization of charge at δ<0.3 that is stabilized near the interface (see minima of red and green curves vs. blue). 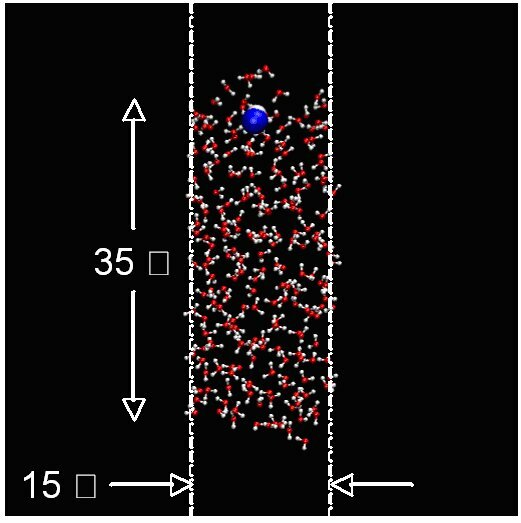 The researchers' simulations are clarifying the free-energy surface of reactions that a hydroxide anion can undergo as a function of the interfacial depth. The hydroxide anion is unique in its chemistry under normal solvation conditions. However, preliminary results indicate that near the liquid-vapor interface, it resembles a delocalized anion. Their new information will be used to draw conclusions about the whereabouts of the hydroxide anion and the implications towards our understanding of chemical reactions at hydrophobic interfaces and the pH of these interfaces. What's next: These methodologies pave the way for elucidating the chemistry of other complex ions at interfaces. All calculations were performed with the publicly available CP2K package. 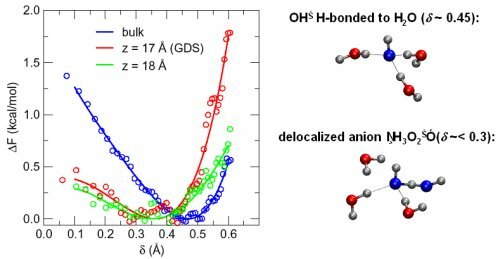 The work on hydroxide is in collaboration with Prof. Doug Tobias (UC-Irvine), Mark Tuckerman, (NYU), Liem Dang (PNNL) and I. F. Will Kuo (LLNL) and is currently being written up for publication in distinquished journals in the field. Acknowledgments: This work was supported through the U.S. Department of Energy (DOE) Office of Advanced Scientific Computing Research and DOE's Innovative and Novel Computational Impact on Theory and Experiment (INCITE) program. The Pacific Northwest National Laboratory creates computational capabilities to solve problems using extreme scale simulation and peta-scale data analytics to advance scientific frontiers for U.S. innovation. Research team: Chris Mundy, Shawn Kathmann, Greg Schenter, Roger Rousseau, all of Pacific Northwest National Laboratory, and Alessandro Curioni, of IBM-Zurich. Citation: C. J. Mundy, R. Rousseau, A. Curioni, S. M. Kathmann, and G. K. Schenter, “A molecular approach to understanding complex systems: computational statistical mechanics using state-of-the-art algorithms on tera-scale computational platforms,” Journal of Physics Conference Series, (2008).